This topic provides an overview of when and how to use async programming and includes links to support topics that contain details and examples. Asynchrony is essential for activities that are potentially blocking, such as when your application accesses the web. Access to a web resource sometimes is slow or delayed. If such an activity is blocked within a synchronous process, the entire application must wait. In an asynchronous process, the application can continue with other work that doesn't depend on the web resource until the potentially blocking task finishes. The following table shows typical areas where asynchronous programming improves responsiveness. The listed APIs from the .NET Framework 4.5 and the Windows Runtime contain methods that support async programming. Asynchrony proves especially valuable for applications that access the UI thread because all UI-related activity usually shares one thread. If any process is blocked in a synchronous application, all are blocked. Your application stops responding, and you might conclude that it has failed when instead it's just waiting. When you use asynchronous methods, the application continues to respond to the UI. You can resize or minimize a window, for example, or you can close the application if you don't want to wait for it to finish. The async-based approach adds the equivalent of an automatic transmission to the list of options that you can choose from when designing asynchronous operations. That is, you get all the benefits of traditional asynchronous programming but with much less effort from the developer. The Async and Await keywords in Visual Basic and the async and await keywords in C# are the heart of async programming. By using those two keywords, you can use resources in the .NET Framework or the Windows Runtime to create an asynchronous method almost as easily as you create a synchronous method. Asynchronous methods that you define by using async and await are referred to as async methods. The following example shows an async method. Almost everything in the code should look completely familiar to you. The comments call out the features that you add to create the asynchrony. You can find the complete example file at the end of this topic, and you can download the sample from Async Sample: Example from "Asynchronous Programming with Async and Await". If AccessTheWebAsync doesn't have any work that it can do between calling GetStringAsync and awaiting its completion, you can simplify your code by calling and awaiting in the following single statement. The following characteristics summarize what makes the previous example an async method. The method signature includes an Async or async modifier. The name of an async method, by convention, ends with an "Async" suffix. Task if your method has a return statement in which the operand has type TResult. Task if your method has no return statement or has a return statement with no operand. Void (a Sub in Visual Basic) if you're writing an async event handler. For more information, see "Return Types and Parameters" later in this topic. The method usually includes at least one await expression, which marks a point where the method can't continue until the awaited asynchronous operation is complete. In the meantime, the method is suspended, and control returns to the method's caller. The next section of this topic illustrates what happens at the suspension point. In async methods, you use the provided keywords and types to indicate what you want to do, and the compiler does the rest, including keeping track of what must happen when control returns to an await point in a suspended method. Some routine processes, such as loops and exception handling, can be difficult to handle in traditional asynchronous code. In an async method, you write these elements much as you would in a synchronous solution, and the problem is solved. For more information about asynchrony in previous versions of the .NET Framework, see TPL and Traditional .NET Framework Asynchronous Programming. The most important thing to understand in asynchronous programming is how the control flow moves from method to method. The following diagram leads you through the process. The numbers in the diagram correspond to the following steps. 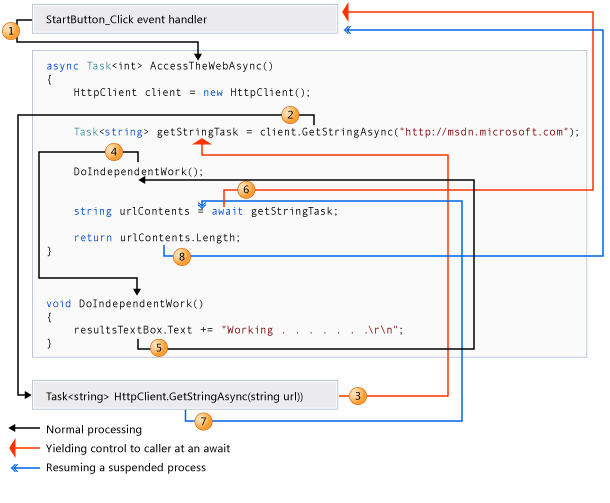 An event handler calls and awaits the AccessTheWebAsync async method. AccessTheWebAsync creates an HttpClient instance and calls the GetStringAsync asynchronous method to download the contents of a website as a string. Something happens in GetStringAsync that suspends its progress. Perhaps it must wait for a website to download or some other blocking activity. To avoid blocking resources, GetStringAsync yields control to its caller, AccessTheWebAsync. GetStringAsync returns a Task where TResult is a string, and AccessTheWebAsync assigns the task to the getStringTask variable. The task represents the ongoing process for the call to GetStringAsync, with a commitment to produce an actual string value when the work is complete. Because getStringTask hasn't been awaited yet, AccessTheWebAsync can continue with other work that doesn't depend on the final result from GetStringAsync. That work is represented by a call to the synchronous method DoIndependentWork. DoIndependentWork is a synchronous method that does its work and returns to its caller. AccessTheWebAsync has run out of work that it can do without a result from getStringTask. AccessTheWebAsync next wants to calculate and return the length of the downloaded string, but the method can't calculate that value until the method has the string. Therefore, AccessTheWebAsync uses an await operator to suspend its progress and to yield control to the method that called AccessTheWebAsync. AccessTheWebAsync returns a Task(Of Integer) or Task<int> to the caller. The task represents a promise to produce an integer result that's the length of the downloaded string. If GetStringAsync (and therefore getStringTask) is complete before AccessTheWebAsync awaits it, control remains in AccessTheWebAsync. The expense of suspending and then returning to AccessTheWebAsync would be wasted if the called asynchronous process (getStringTask) has already completed and AccessTheWebSync doesn't have to wait for the final result. Inside the caller (the event handler in this example), the process is repeated. The caller might do other work that doesn't depend on the result from AccessTheWebAsync before awaiting that result, or the caller might await immediately. When the event handler reaches an await expression, the application focuses on the completion of GetStringAsync. The event handler is waiting for AccessTheWebAsync, and AccessTheWebAsync is waiting for GetStringAsync. GetStringAsync completes and produces a string result. The string result isn't returned by the call to GetStringAsync in the way that you might expect. (Remember that the method already returned a task in step 3.) Instead, the string result is stored in the task that represents the completion of the method, getStringTask. The await operator retrieves the result from getStringTask. The assignment statement assigns the retrieved result to urlContents. When AccessTheWebAsync has the string result, the method can calculate the length of the string. Then the work of AccessTheWebAsync is also complete, and the waiting event handler can resume. In the full example at the end of the topic, you can confirm that the event handler retrieves and prints the value of the length result. If you are new to asynchronous programming, take a minute to consider the difference between synchronous and asynchronous behavior. A synchronous method returns when its work is complete (step 5), but an async method returns a task value when its work is suspended (steps 3 and 6). When the async method eventually completes its work, the task is marked as completed and the result, if any, is stored in the task. For more information about control flow, see Control Flow in Async Programs (C# and Visual Basic). You might be wondering where to find methods such as GetStringAsync that support async programming. The .NET Framework 4.5 contains many members that work with async and await. You can recognize these members by the "Async" suffix that’s attached to the member name and a return type of Task or Task. For example, the System.IO.Stream class contains methods such as CopyToAsync, ReadAsync, and WriteAsync alongside the synchronous methods CopyTo, Read, and Write. The Windows Runtime also contains many methods that you can use with async and await in Windows Store apps. For more information and example methods, see Quickstart: using the await operator for asynchronous programming, Asynchronous programming (Windows Store apps), and WhenAny: Bridging between the .NET Framework and the Windows Runtime (C# and Visual Basic). If you specify that a method is an async method by using an Async or async modifier, you enable the following two capabilities. The marked async method can use Await or await to designate suspension points. The await operator tells the compiler that the async method can't continue past that point until the awaited asynchronous process is complete. In the meantime, control returns to the caller of the async method. The suspension of an async method at an await expression doesn't constitute an exit from the method, and finally blocks don’t run. The marked async method can itself be awaited by methods that call it. An async method typically contains one or more occurrences of an await operator, but the absence of await expressions doesn’t cause a compiler error. If an async method doesn’t use an await operator to mark a suspension point, the method executes as a synchronous method does, despite the async modifier. The compiler issues a warning for such methods. In .NET Framework programming, an async method typically returns a Task or a Task. Inside an async method, an await operator is applied to a task that's returned from a call to another async method. You specify Task as the return type if the method contains a Return (Visual Basic) or return (C#) statement that specifies an operand of type TResult. You use Task as the return type if the method has no return statement or has a return statement that doesn't return an operand. The following example shows how you declare and call a method that returns a Task or a Task.
' The body of the method should contain one or more Await expressions.
' Return statement specifies an integer result.
' Calls to TaskOfTResult_MethodAsync from another async method.
' The method has no return statement.
' Calls to Task_MethodAsync from another async method. // Calls to TaskOfTResult_MethodAsync from another async method. // Calls to Task_MethodAsync from another async method. Each returned task represents ongoing work. A task encapsulates information about the state of the asynchronous process and, eventually, either the final result from the process or the exception that the process raises if it doesn't succeed. An async method can also be a Sub method (Visual Basic) or have a void return type (C#). This return type is used primarily to define event handlers, where a void return type is required. Async event handlers often serve as the starting point for async programs. An async method that’s a Sub procedure or that has a void return type can’t be awaited, and the caller of a void-returning method can't catch any exceptions that the method throws. An async method can't declare ByRef parameters in Visual Basic or ref or out parameters in C#, but the method can call methods that have such parameters. For more information and examples, see Async Return Types (C# and Visual Basic). For more information about how to catch exceptions in async methods, see try-catch (C# Reference) or Try...Catch...Finally Statement (Visual Basic). For more information and an example, see Quickstart: using the await operator for asynchronous programming. By convention, you append "Async" to the names of methods that have an Async or async modifier. You can ignore the convention where an event, base class, or interface contract suggests a different name. For example, you shouldn’t rename common event handlers, such as Button1_Click. Shows how to convert a synchronous WPF solution to an asynchronous WPF solution. The application downloads a series of websites. Adds Task.WhenAll to the previous walkthrough. The use of WhenAll starts all the downloads at the same time. Demonstrates how to start several tasks at the same time. Illustrates the types that async methods can return and explains when each type is appropriate. Traces in detail the flow of control through a succession of await expressions in an asynchronous program. Shows how to handle cases in which an active asynchronous operation is restarted while it’s running. Shows how to bridge between Task types in the .NET Framework and IAsyncOperations in the Windows Runtime so that you can use WhenAny``1 with a Windows Runtime method. Shows how to bridge between Task types in the .NET Framework and IAsyncOperations in the Windows Runtime so that you can use CancellationTokenSource with a Windows Runtime method. Lists and demonstrates the benefits of using async and await to access files. Demonstrates the control flow at an await statement, and demonstrates the behavior of the Step Into, Step Over, and Step Out commands within async methods. Describes a new pattern for asynchrony in the .NET Framework. The pattern is based on the Task and Task types. Shows how to use async and await in a Windows Store app. Provides an overview of asynchronous programming in the Windows Runtime. Provides links to a variety of videos about async programming. The following code is the MainWindow.xaml.vb or MainWindow.xaml.cs file from the Windows Presentation Foundation (WPF) application that this topic discusses. You can download the sample from Async Sample: Example from "Asynchronous Programming with Async and Await". // Call and await separately. //// You can do independent work here. // Working . . . . . . .
// Length of the downloaded string: 41564.